Amputation is the removal of a limb or extremity: arm, leg, hand, foot, finger or toe. Amputation is a treatment of last resort, performed only after all other forms of treatment have failed. It is used to treat severe infection, disease progression, removal of a tumor on a bone or muscle, or persistent pain. Before undergoing an amputation, a thorough physical examination is performed to verify that amputation is the only feasible option. The most common type of amputation is removal, either above or below the knee, of the leg. Although patients with PAD are usually treated successfully in other ways, it is patients with this disorder, particularly those who also have diabetes, who account for the great majority of amputations. Amputation is a serious surgical procedure that usually requires either general or spinal anesthesia. Because of the trauma to the patient, general anesthesia may be preferred, particularly when a limb, rather than a digit, is removed. After amputation, the incision is either closed immediately or kept open for a few days until infection is no longer an issue. Although the hospital stay for an amputation may be relatively short, the recuperative period is longer, involving as it does both physical and psychological rehabilitation, as well as adjustment to altered mobility or dexterity. In most cases, amputation also requires postsurgical adjustment to a prosthetic device. 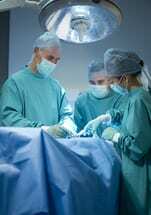 At times, due to the trauma of having a body part removed, the patient has a severe psychological reaction. Because emotional issues can interfere with healing and overall health, psychotherapy or psychotropic medication may be necessary. A hospital stay of 1 to 2 weeks is usually required after an amputation. During these weeks, the site is monitored to verify that proper healing is taking place. Prescription painkillers are administered as necessary during the recovery period. As soon as sufficient healing has taken place, the patient begins physical therapy to learn how to perform the day-to-day tasks that involved the amputated limb. 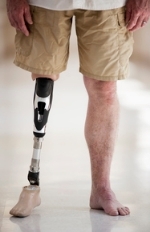 In many cases, the patient, when sufficiently healed, is fitted with a prosthesis, a device that replaces the amputated limb, and then given therapeutic instruction on how to use it. In rare instances, it may be possible for an amputee to have a limb transplanted from a donor's body. This involves extremely complex surgery and rehabilitation, but can be highly successful. If a limb is successfully transplanted, anti-rejection medications must be taken for the remainder of the recipient's life. There are also unusual cases in which a patient's own digits are transplanted to another part of the body where they will be more useful.